October 10, 2018, has been declared Put the Brakes on Fatalities Day. Traffic crashes in 2016 caused 37,461 fatalities. Those crashes caused over 2 million injuries and an average of 102 people died each day. That is one fatality every 14 minutes. In 2016, 48% of passenger vehicle occupants killed in traffic crashes were unrestrained. Distracted driving is a dangerous epidemic on America’s roadways. In 2016, there were 3,450 people killed and an estimated 391,000 injured in motor vehicle crashes involving distracted drivers. Alcohol-related crashes accounted for 28% of all traffic fatalities and speeding was a contributing factor in 27% of all fatal crashes. In 2016, motorcyclists accounted for 14% of all fatalities with 41% known not wearing a helmet. The use of safer driving behaviors such as not talking or text messaging on cell phones, the use of seat belts and helmets (motorcycles), not drinking and driving, and obeying traffic laws would dramatically reduce the number of traffic-related injuries and deaths. 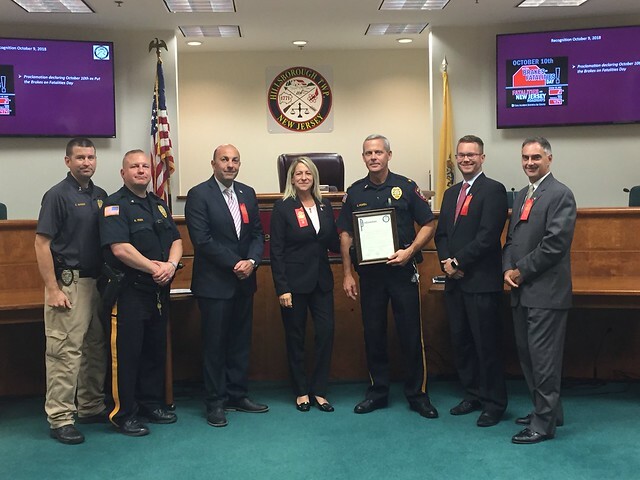 The Hillsborough Township Committee proclaimed October 10, 2018, as Put the Brakes on Fatalities Day, and calls upon everyone to help save lives by spreading these important messages throughout our communities specifically on this day as well as all other days of the year.